Chandigarh/ Ludhiana: The Punjab and Haryana High Court today allowed a petition seeking parole for Sikh Political Prisoner Bhai Balbir Singh Bira, who is facing imprisonment for life. 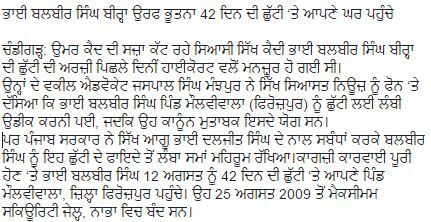 Advocate Jaspal Singh Manjhpur who maintains list of Sikh political prisoners told Sikh Siyasat News (SSN) over phone that Balbir Singh r/o Maulviwala (Ferozepur) is lodged in Maximum security jail, Nabha and his arrest dates back to 25 August, 2009. Advo. Jaspal Singh Manjhpur said that parole of Balbir Singh was long overdue as per prevalent law but the Punjab government had refused to grant him parole benefits due to his association with Sikh leader Bhai Daljeet Singh. The petition seeking parole for Bhai Balbir Singh was pending in the Punjab and Haryana High Court for around a year now. Holding hearing of petition today, a bench comprising Justice M Jay Paul and Saneha Prashar, who had granted 6 weeks parole to Balbir Singh.